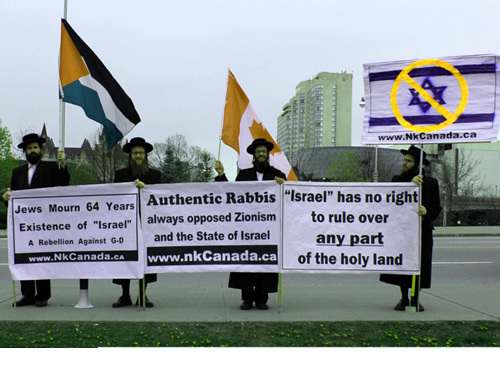 On the Israeli Independence Day, April 26, 2012, Anti Zionist Orthodox Jews protested an Israeli Flag Raising ceremony in front of the City hall in Ottawa, Canada. Rabbi Dovid Feldman of Neturei Karta International speaking. A similar protest took place in Montreal, Quebec on April 25, 2012. Demonstrations are held each year on this day. See past demonstrations.